I create my KMZ file in Google Earth Pro, then upload it into the EO Browser. The problem is that the something is shifted, and now does not align with the KMZ file. I.e. the polygon kmz file is shifted by about 5 meters. Might it be that it is simply an inaccuracy of the satellite imagery? Hi, thanks for the reply. Seems very odd that it’s consistently out though? 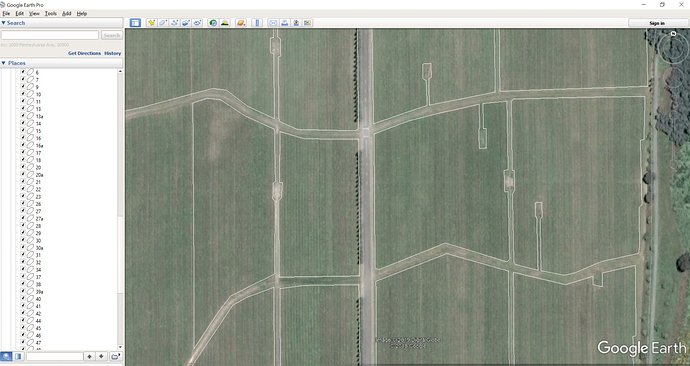 The first is of the google earth desktop. Note that the blocks outlined are at the edges of the field (i.e. NOT going over the roads). I used the blocks outlined as a KMZ. The second is of the EO browser. I uploaded the saved KMZ file from google earth desktop. 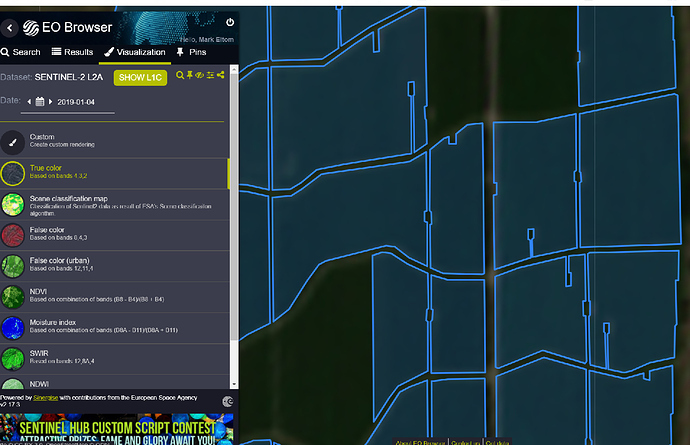 Note that the outline of the fields is now shifted. I measured it and it is about a 10m shift. This is really bad for our application (viticulture) as we have frost fans etc and are using NDVI images to inform where to target our management practices. Thus, a false negative will skew everything else! At first I thought it was my KMZ file. So, I tried opening up google maps in QGIS and the KMZ file aligned perfectly. Is it possible that the Sentinel Hub data is off by 10m? The geopositional accuracy of Sentinel-2 depends on various things but as the overall accuracy is 0.7 px, so 7 meters, you cannot rely on perfect position. These problems are usually addressed by creating a “negative buffer”, e.g. not counting the border areas. Perfect, thanks for the reply! Owe you a beer. Do you know how to shift either the downloaded satellite data to align with the geoposition of the KMZ file (or vise versa)? How to shift a raster in QGIS?